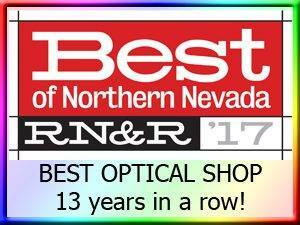 Thank you for voting for Adlington Eye Center as the best Optical Shop and Sunglass Shop in Northern Nevada for 2017! We are honored to receive both awards this year and will strive to prove your faith in us is well deserved. 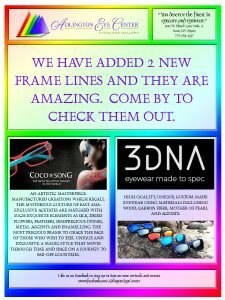 Stop by and check our our boutique and fabulous staff to experience why we were voted the best Optical Shop for 13 years in a row! Thanks again to everyone who voted. Retinal imaging is a great tool in the early detection of retinal and systemic diseases. The images are used to detect diseases such as diabetes and macular degeneration, and the images are a critical piece of the diagnostic puzzle in confirming the health of the retina, optic nerve and other structures. You will hear us say that a picture of the retina is worth a thousand words and gives information that rivals a mini-physical exam. The digital phoropter is used to get the best possible prescription for your new glasses. You will appreciate the updated technology and actually find it easier to make decisions during your exam due to the simultaneous viewing during the examination. The Frequency Doubling Technology (FDT) visual field instrument is the latest in technology and is a quick and easy screening of your peripheral vision. The Smart Mirror allows you to see several different images of yourself with different eyeglass frames on, side by side. You can put your own glasses on to view your pictures and assist in your decision about which frame looks the best on you. The Smart Mirror also has a feature that will allow you to see how you look in colored contact lenses without having to put them in your eyes. You can narrow your choices down before trying on your favorites . At Adlington Eye Center we believe that eye exams should be as comfortable and accurate as possible. The non-contact tonometer (NCT) is more often referred to as the "air puff" test. A very light puff of air is directed at your eye and the pressure in your eye is measured. This is an excellent screening method for high pressures which may be associated with glaucoma. There are times when other methods of assessing pressures may be performed, such at Goldmann tonometry (GAT), at the doctor's discretion and, of course, with your consent and thorough education.